On the 18th April, Ugo Bardi posted a piece on The Oil Drum discussing some of the dark sides of coal mining. In particular he started with one of his favorite paintings “The Riverbank’ by Telemaco Signorini. He ties this picture of men towing a coal barge into a memory of his earlier life. And so, from the other end of that supply chain, that brought coal to Florence, today I am going to talk about the early history of coal, but from the region around Newcastle, and further north up by Alnwick, which is where my coal-mining ancestors came from. 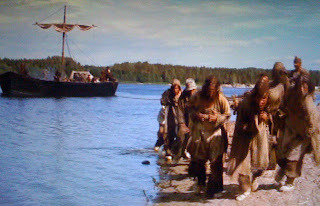 When I saw Ugo’s painting I was immediately reminded of the movie “1612” which has, in a more modern recreation, more than five men hauling a boat. The commentary that comes with the DVD makes some point of the difficulty in hauling the boat, even though it was relatively small and there are more than twice as many men as Ugo portrayed. It was also unladen. Though the crew look strong, they are after all actors, and are attached to the boat by a harness of ropes that it likely take more time for them to learn to properly operate than they had for that shoot. 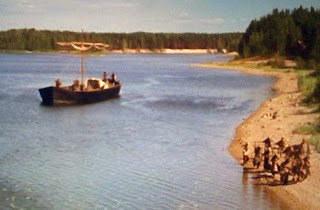 (As one of the comments on Ugo’s post noted, this scene could have been taken to reproduce the Russian painter Ilya Repin’s painting “Burlaki” which it emulates). Ugo also deals more with the political constraints in the coal trade after 1860. Since I am more concerned with discussing reserves and methods of mining and the more technical considerations, I am going to start a little earlier in the use of coal, when it was mined in the UK, and some of the early practices. When coal was first used, the legends have it that it was collected along the sea coast near Tynemouth in the North-East of England, and taken to the local priory and the rights to the coal were given to the monks. (The scene is illustrated in the movie “Nine Centuries of Coal.” (Which if I understand the BFI rules you can download if you are at a British University or school). 8 chaldrons at Newcastle, makes at London about 15 chaldron. The unit was abolished in 1963. So we know that coal was heading down to London, where King Edward (because the fumes apparently sickened his mother) banned it, with the threat of torture and death to those that used it. (This is the king that had Wllliam Wallace, as played by Mel Gibson in Braveheart, chopped into bits, while alive, so he generally wasn't someone you wanted to mess with). But is was sufficiently cheaper than the wood alternative that the ban had little effect, and coal has been a major fuel in the United Kingdom ever since. The king, incidentally, was compensated in other ways, since a royal duty was imposed on the mining and shipping of coal, that brought in a large income over the years. 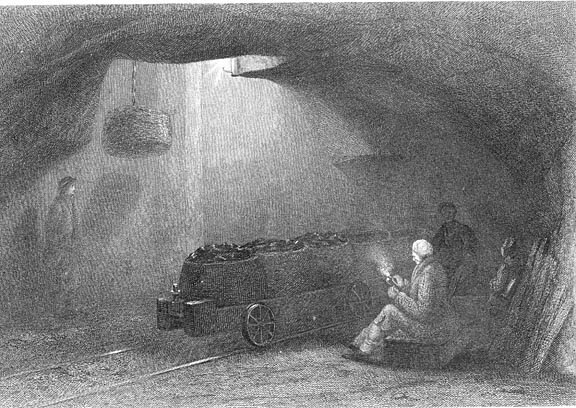 In 1818 the mines were estimated to produce 15 million tons a year, for domestic use, with additional amounts used by industry. The duty was 9 shillings and four pence to London, and 6 shillings to other ports in the UK. And this brought in a revenue of 570,066 pounds in 1816. Some 2.25 million chauldrons of coal were shipped, roughly half of which originated in Newcastle. 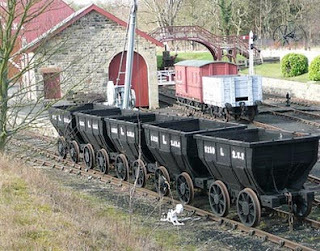 The coal was generally taken by rail, though hauled by horse until the invention of the locomotive (by a local miner), down to the river where equipment known as “drops” were used to swing the chauldron down to the collier for unloading. The staithes includes the short pier and feeds to the drop. At its extremity is fixed the drop, consisting of a square frame hung upon pulleys, and counterbalanced by back weights. 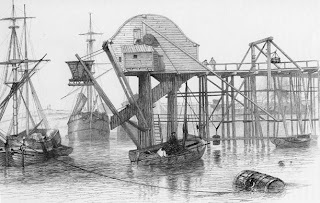 The loaded wagon, together with the square frame, descends by its own gravity to the hatchway of the vessel, delivers its coals, and, in turn the empty wagon is returned by means of the balance weights, the motion heing in both cases regulated by a brake wheel. A man is lowered down with the wagon , whose business is to unhasp its moveable bottom, and thereby let the coals drop into the hold of the vessel. The drop was patented in 1800 by Wm Chapman. A tapered spout led the coal into the hold of smaller keels (the boats used to carry the coal out to larger ships). The main coal mined came from the Bensham and I 1836 93 ships carried some 15,519 tons of this coal through the staithe at Wallsend to London, where it sold for 7s 9d a ton, while one ship carried 318 tons from the Bensham Wallsend, and it sold for 8s 6d a ton. (Personal note – I have worked in the Bensham seam, albeit some 125 years later). 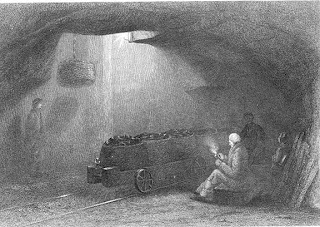 Mining had progressed by that time from the initial collection of loose coal washed up on the beach (sea coal) to mining it where it outcropped, and then mining back into the seam outcrop from the surface, and this often meant that the tunnel that was mined sloped down into the ground. 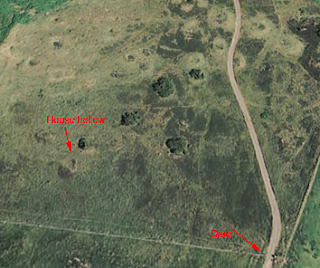 The dirt that was mined out was dumped at the entrance to the tunnel, and often created a small narrow feature on the ground, a tip, some of which can still be seen today. Our family, for example, used to be coal miners at Eglingham. 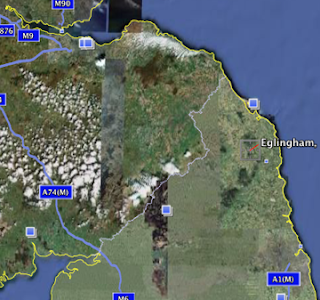 This is a small village found in the North East of England, not that far from the Scottish border. 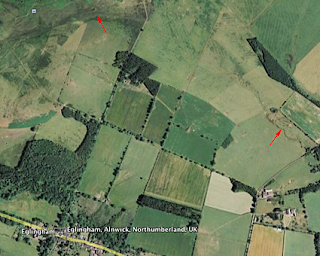 I have marked an overview of the village with a couple of arrows to show where the two tips were that I have walked around (and where my ancestors no doubt worked) on an overall view of the village (using Google Earth) which is at the bottom of the picture. Given the fact that I am going to show you that it was a mining site, it was wryly amusing to see signs in the local parish hall asking for action to protest the location of wind turbines on this "pristine English countryside." Right in the center of the picture however, if one zooms in until GE tilts a bit, you can see a third tip quite clearly. My aunt (the Teacher) had done some research on where we lived, and this was not down in the current village but up where the top left arrow points, and where all that is left of the houses are circles where the gorse grows, but where rabbit warrens have brought up small pieces of china, and other remnants of the time that folk lived there, only a couple of hundred years ago. In those days it was pre-mechanization, and the miners used only a pick and a shovel to break the coal from the solid. It was then put into woven baskets called corves, that were dragged to the surface on a wooden board, either by younger boys, or by women. The board would slide up the tip, and could be dumped before being dragged back underground. The tunnels were driven to the height of the coal, which in the area may have been somewhere around 4 ft 10 inches (with an interbedded layer of stone that ranged from 3 inches to 2 ft thick) or 5 ft 8 inches, (with 3 ft of interbedded stone) not the richest of workings. It was only after some years, and larger mine developments that the baskets went from being carried on folks backs, or on these boards, to being put on flat cars and moved by rail. Stephenson, who invented the Rocket, the first locomotive as a way of hauling mine chauldrons down to the staithes, began his working career by weaving canes into these corves in a pit yard. In these small operations, with all the excavation from the initial tunnel into the side of the hill, the coal was mined by individual workers, or families. The miner would work with a candle as a light, and that would be mounted to a wooden post that he would use to hold the roof up. Laying on his side, he would then take his pick and cut out a slot at the bottom of the coal. This undercut, perhaps 3 ft deep, would be cut along the total face of the coal, before the miner would start to work up. Depending on the size of the tunnel he may also make a vertical cut to create a second free face. 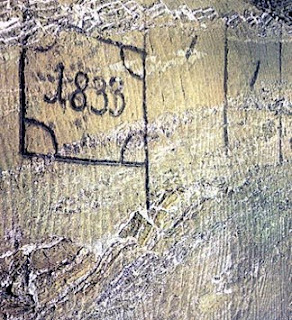 (You can see some of these markings in the walls of old stone quarries, and in the mines under Bath in the UK, and the salt mine at Wieliczka in Poland). He would then break out the coal in individual lumps that were several inches in size. (4-6 would be ideal). If he used the joints (called cleat) and the bedding planes of the coal, then this was not too difficult to do, and so he could mine out several chauldron’s worth of coal in a shift. In the measurement of the work he did using a modern measure it would take as little as 4 joules/cc of energy to break out that coal. Wall at Wielicza, showing the pick patterns used to cut the initial slot to which the rest of the rock would then be broken. A typical shift would be around 8 hours, but it shrank, so that when I went into the mines it lasted only 7.25 hours. As well as mining the coal, the miner had to hold up the roof, and, if there was a roof fall repair it. But of all his concerns the most prevalent was that of gas. Remember both that he had to breathe, and that coal emits methane, or natural gas, from most seams. The methane will burn, or in the right concentrations in the mine can explode. And when that happens it consumes all the oxygen, so that even if the miners aren’t in an area where the explosion happened then they may still die as the de-oxgenated air circulates underground. 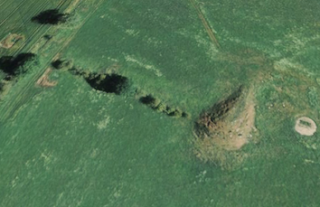 Initially the miners would work only a short distance into the outcrop and though the mining site here was worked at least from the early 1700’s, in the south of England miners had already learned to sink shafts and to mine out from them – but I will get to that next time.